Channahon Antiques Fair — join Rich | Essex Estate Services, Ltd.
Join Rich as he takes his show on the road and appraises antiques and collectibles at the Channahon Antiques Fair. 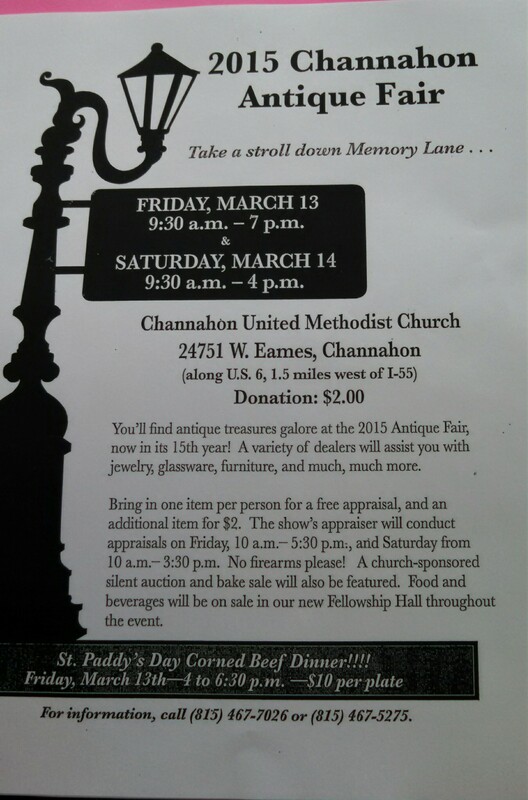 The fair will be held at the Channahon United Methodist Church at 24751 West Eames Street, Channahon, IL 60410. It will run Friday and Saturday March 13th and 14th. DescriptionAntique treasures with a variety of dealers to assist you with jewelry, glassware, furniture, and much more. One item per person is allowed for a FREE appraisal, $2 for each additional item. Appraisers will be available Friday 3/13 from 10a to 5:30pm and on Saturday 3/14 from 10am to 3:30pm. 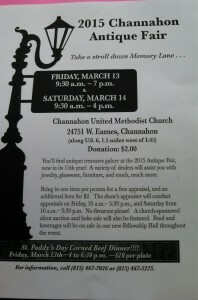 There will also be an antique silent auction and bake-sale. Food and beverages will be available for purchase featuring ‘St. Patty’s Day Corned Beef Dinner’ on Friday 3/13 4p-to 6:30pm $10 per dinner.